This cake was on my list as one of the things I would make in 2018. And it's only February and I've already made it, along with Cuban Quesadillas and Instant Pot Cheesecake. I've learned this is the way to make the things on my list - make them early in the year! And the great thing about making it early in the year? Lots of opportunities to make it AGAIN! And who wouldn't want to make this again and again? 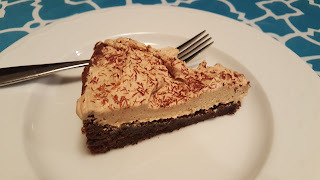 It's a brownie cake with cookie butter frosting! Do you know cookie butter? It's made out of those unique Biscoff cookies that you get, among other places, on Delta flights! It has a really distinguishable flavor that is different from anything else. It's great to use in cakes, cookies and bars. This dessert is very sweet, as you might imagine, you can cut the pieces small, and serve with piping cups of coffee. My dinner guests loved it, and my kids' response on seeing it on the counter: "WHAT is that CAKE?" I guess I should use chocolate shavings more regularly to avoid the shock factor. Find more great ideas at Inspiration Monday, Busy Monday, Inspire Me, Fabulous, Hearth and Soul, Wow Me, Wow Us, Whisk It, Let's Party, Full Plate, Wonderful Wednesday. In a medium saucepan over medium heat, melt the butter. Remove the pan from the heat, add the dark chocolate and coffee, and let sit for about 30 seconds, then whisk it all together until smooth and glossy. Add the brown sugar and vanilla, and whisk until smooth. Whisk in the eggs, 1 at a time, then sprinkle in the flour, baking powder, and salt. Fold in the dry ingredients gently until no flour specks remain. Spread the brownie mixture into a greased 9" springform pan and bake at 350 for 25 to 30 minutes, or until the cake has puffed slightly and the top is settled. Transfer to a wire rack to cool completely before removing the sides of the springform pan. For the frosting, in a large bowl, using an electric mixer on medium speed, mix together the cookie butter and butter for a full minute so it’s light and fluffy. Add the powdered sugar, salt, and half and half and beat for another minute, or until the mixture is fluffy and spreadable. 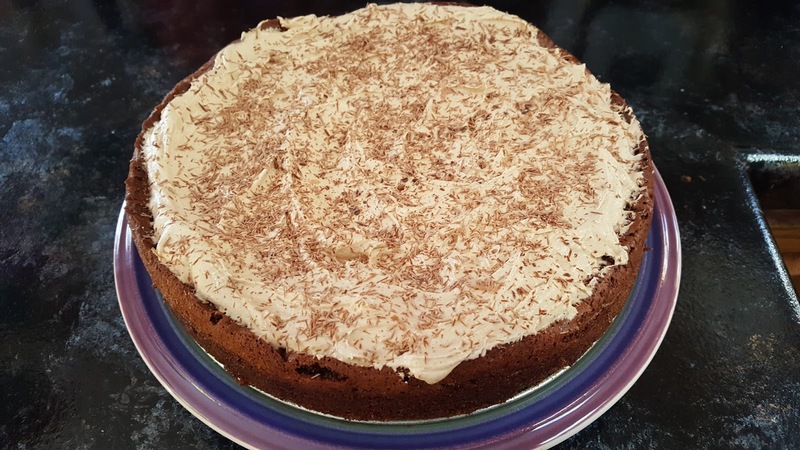 Spread the frosting on the cake, garnish with chocolate shavings, and cut into wedges to serve. Leftovers can be stored, covered, at room temperature for up to 3 days or in the refrigerator for up to 5 days. Makes 8-12 servings. Your Brownie Cake with Cookie Butter Frosting will be a very special treat, it looks fabulous! Thanks so much for sharing your awesome post with us at Full Plate Thursday. Have a great week and come back soon!